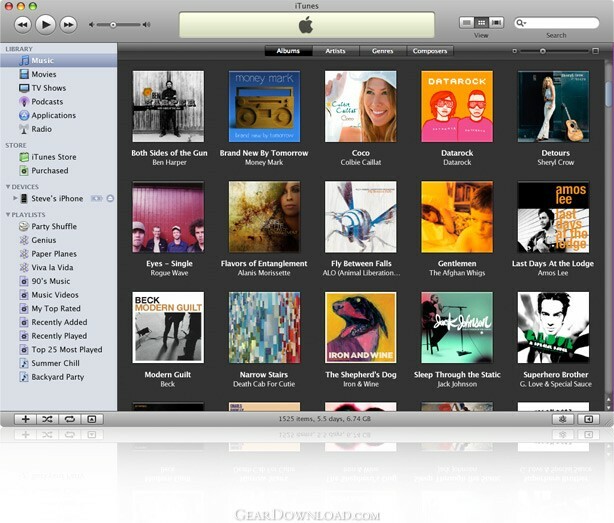 Apple iTunes organizes & plays your digital music & video, a free application for Mac or PC. When you want to watch or listen to something, you no longer have to look through your CDs or flip through channels - just open iTunes. iTunes syncs all your media with iPod, iPhone & Apple TV. And it's a store on PC, iPod touch, iPhone and Apple TV that has everything you need to be entertained. Apple iTunes store 11 million high-quality, DRM-free songs. Organizes & plays your digital music & video, a free application for Mac or PC. ...... through its built-in music store, run a visualizer to display graphical effects in time to the music as well as encode music into a number of different audio formats. iTunes includes the Quicktime Player installer. Apple iTunes Store over 11 million high-quality, DRM-free songs. Visit the Apple iTunes Store on your computer, iPhone, iPod touch, or Apple TV. Browse around and have a listen. Preview a song before you buy it and get recommendations based on music you love. And that's just music. You can also rent or buy blockbuster movies, get HD episodes of your favorite TV shows, shop for audiobooks, and download apps for your iPhone or iPod touch. Subscribe to free podcasts about anything and everything. Convert DVD movie to iTunes, TV DVD to iTunes. Transfer music,playlists,video back to iTunes. easily backup, zip, package or move any or all of your iTunes Music Library. Transfer music, playlists and video back to iTunes. Securely access and play your iTunes Music Library. Convert DVD to Apple TV: a Powerful DVD to Apple TV converter! Convert PowerPoint to Apple TV MP4 video formats with the best quality. This eBook offers many Apple Recipes that is the most popular fruit in America. iTunes Export Wizard Export playlists defined in your iTunes Music Library. Qweas is providing links to Apple iTunes 10.7.0.21 as a courtesy, and makes no representations regarding Apple iTunes or any other applications or any information related thereto. Any questions, complaints or claims regarding this application Apple iTunes 10.7.0.21 must be directed to the appropriate software vendor. You may click the publisher link of Apple iTunes on the top of this page to get more details about the vendor.